Vickers Petters Engine Restoration – Paper Never Refused Ink! Reproduced here with the kind permission of the Editor of An Cosantóir, this is my Article which featured in the April 2017 edition. 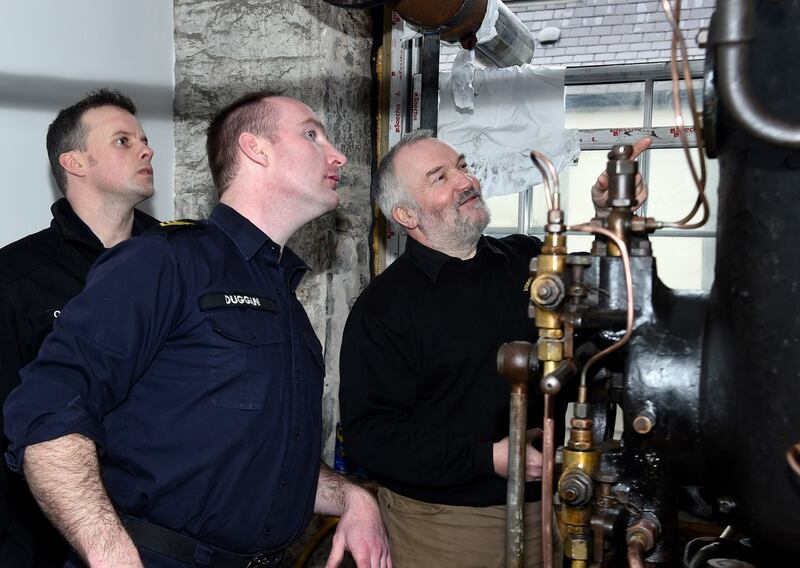 In 2012 while passing the Seamanship Bay on the Naval Base during some renovation works PO/ERA Alan Duggan chanced to come across a collection of old machinery. He spotted what he thought might be a type of ‘Hot Blub’ stationary engine and he began to seek out information as to how it came to be there. How was he able to identify this so readily while just passing by? Well, because PO/ERA Duggan has in his collection a ‘Blackstone, Type W 1920, Hot bulb stationary engine in full running condition’. However there was a pause of nearly two years and a lot of nautical miles under his hull before PO/ERA Duggan rotated ashore from his sea going unit. 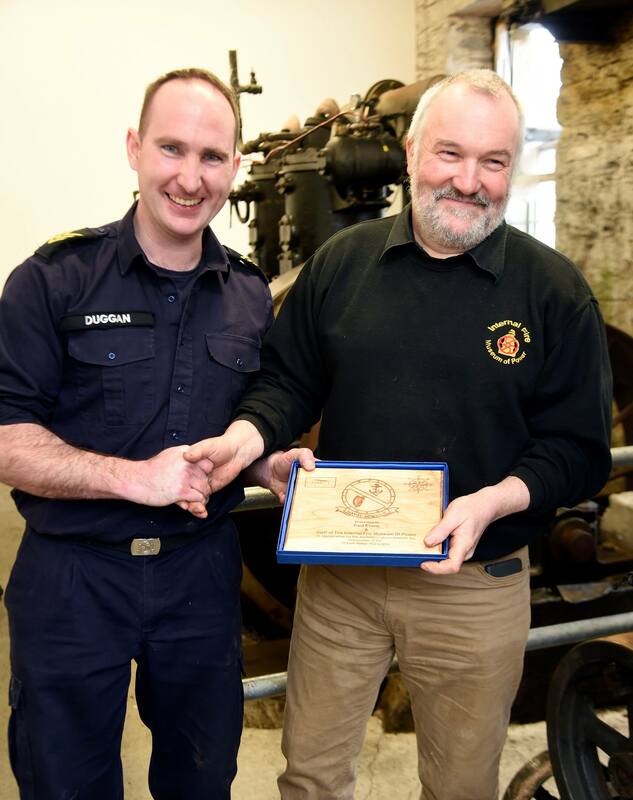 Never a man to stay still, PO/ERA Duggan renewed his investigations when he was selected to serve with the Technical Training School (TTS) of the Naval College co-located in Ringaskiddy with the National Maritime College of Ireland (NMCI). He considered that ‘the classes of technical trainees would benefit from some hands on instruction in two stroke technology as well as the opportunity to instil in them some appreciation of historical engineering’. The TTS/NMCI have a selection of both running and ‘sectioned’ engines on which young tradesmen and engineers learn operations, watch-keeping and maintenance. However, these are primarily four stroke engines and PO/ERA Duggan thought that this old engine could provide a ‘living classroom’. Having sought sanction from Lt Cdr Clodagh McConnell, OIC TTS and from Cdr Steve Walsh, Officer Commanding the Naval College & Associate Head of the NMCI. The project was brought to Support Command HQ to Captain (NS) Mick Malone who facilitated PO/ERA Duggan in gaining access to the engines location. Cdr William Roberts visited and secured assistance from the Naval Dockyard civilian employees, which was a huge benefit. The first task was to correctly identify the engine, its name plate having been removed at some point prior. The casted block revealing that it was a ‘Vickers Petters’ engine. PO/ERA Duggan made contact with the curator of the ‘Internal Fire Museum’ in North Wales, Mr Paul Evans, who recommended locating the makers marks on the crankshaft, head and bearing caps. These vital pieces of information identified the engine; a Vickers Petters Model VE2, two stroke, hot blub, semi-diesel. A very rare historically item. It may well be the only one of this model still in existence, certainly it is the only one in Ireland or the EU. Trolling through the archives of the ‘Internal Fire Museum’ lead to the discovery that on the 29th of June 1922 the Cork Electric Tram & Lighting company took delivery of this Vickers Peters Model VE2 onto the dockyard side of Haulbowline. Above: PO/ERA Duggan, PO/ERA O’Hara and Mr. Paul Evans. Haulbowline had been spilt in half by the British. A dockyard on the Eastern half and a military installation on the Western half. 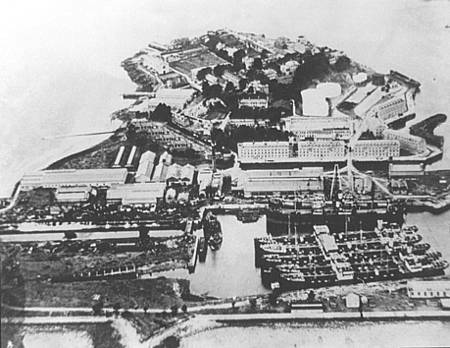 The dockyard side was handed over to the Board of Works in 1923 while the military side & Spike Island remained in British hands under the handover of the treaty ports in 1938. PO/ERA Duggan was unable to gleam much information of the intervening years up until the modern era. The Naval draftsman Mr. Neil Rasmussen says that when he investigated some drawings from many years ago that ‘the Model VE2 stationary engine was driving a dynamo supplying electrical current to the massive capstans located at the head of the slipways which run adjacent to the buildings’. It was by these capstans that the small boats were removed from the waters and hauled up the slips for maintenance and repair. 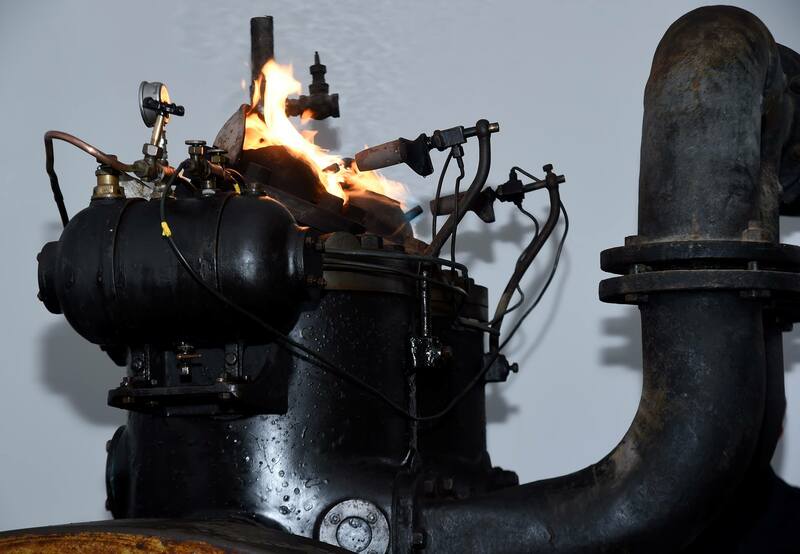 The last known report of the engine being fired up was discovered by SCPO/ERA Mick Kennedy, who on hearing that a project was getting under way put out a call on social media via the ‘Irish Navy Friends Connection’ page on Facebook. Reports back indicated that it may have possibly been ran in the 1970s. “This engine is known as a semi-diesel engine due to its method of operation.”PO/ERA Duggan explains. “It starts the internal combustion process by the use of kerosene burners to heat the ‘hot blub’ or ‘vaporizer’, mounted on the cylinder head, into which fuel is sprayed, this bulb is connected to the cylinder by a narrow passage called the ‘hot tube’”. Of course, getting the engine back into running condition took a huge effort and no small amount of skill. The engine was seized, it had parts missing and even had broken parts. PO/ERA Duggan introduced many TT/ERAs & Mechanicians to the VE2 for practical instruction, learning valuable lessons in engineering skills and the importance of respecting heritage. The various classes tackled all the jobs required. They helped strip the engine down, cleaned back years of grime and even fabricated guardrails for around the massive exposed flywheel. All the while the classes were learning about the mystery of the two-stroke cycle. 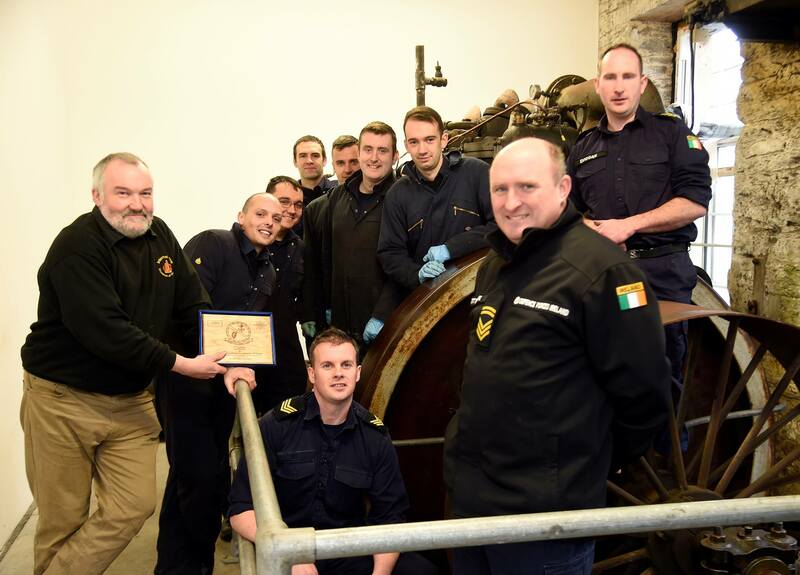 Above: Mr. Paul Evans, CPO/ERA Brian Attridge, PO/ERA David O’Hara, PO/ERA Alan Duggan and Technical Trainee Class A/ERA Shane O’Shaughnessy, A/ERA Sean Kennedy, A/ERA Ian Quilligan, A/ERA Mark Gilligan, A/ERA Michael Hickey. The project is a major success and the noise of this museum piece must be appreciated at close quarters for full effect. A traditionalist when it comes to restoration PO/ERA Duggan feels that ‘the original surface finishes and patinas should be left in place were ever they need not be removed for engineering purposes’. A special oil is all that is applied to the exterior parts; the brass and copper shine brightly against the dark cast surfaces. The OIC TTS is very proud of PO/ERA Duggan’s personal achievements in this project and is grateful to his team members PO/ERA Dave O’Hara and the Technical Training Classes for their hard work and dedication. Mr Evans and his wife travelled to Haulbowline in Feb 2017 to view this masterpiece and they were amazed at its condition and they re-iterated its historical importance. 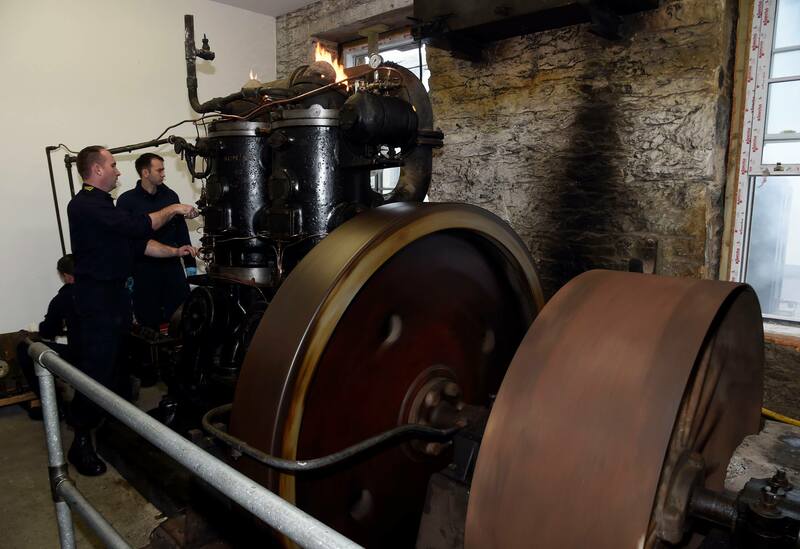 The Internal Fire Museum has had considerable queries regarding this engine since their visit and even suggested a new project! The TTS are very grateful for their visit and a token of appreciation was presented to them. Above: PO/ERA Duggan presents Mr. Paul Evans a small token of appreciation. PO/ERA Duggan hopes ‘that many more generations of ERAs will come in contact with this old workhorse and develop their knowledge while receiving an appreciation for the skills of those who will have worked here in the past’. Let us hope that the VE2 is kept running and that the facility around it continues to improve, so that future generations of sailors can help maintain a rare piece of living history.